The wall of Agia Triada, which separates the peninsula by the same name from the mainland, near the town of Megara, in Attika. I have visited many places over the years by searching the photos in Google Earth. This tactic hasn’t let me down as I have found many interesting places and I still have some I will visit in the future. That is how I found the wall of Agia Triada near Megara. I was looking for something near Athens and I came upon a photo of the wall. It was built at the time of the Revolution against the Ottoman Empire in 1821; specifically, construction began in 1818 and ended in 1823. 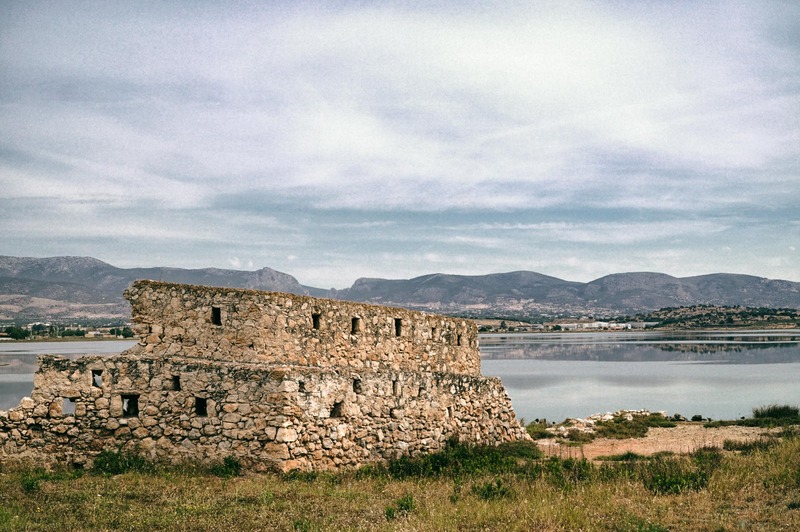 Officially, the purpose for its construction was to separate the lands of the monastery by the same name from the rest of the area; despite the official excuse, the Greek forces used the wall as a stronghold during the revolution. The photo shows the northern end of the wall, before its end into the sea. The weather that day wasn’t very good for my purpose and I still have things I want to do there; since then I will present this image with the cloudy sky as a backdrop.